From the leading online video slots developer, Thunderkick comes another exciting and intriguing slot that takes you on a journey that will shiver your spine. The Stockholm based developer is new to the slots market yet is leading by crafting top notch games. Read on to learn more about this slot game with 17 fixed pay lines. People of all ages in Mexico gather to celebrate Dia de Los Muertos at the start of November. The dress in skeleton costumes, paint their faces to appear like skulls and participate in the celebration. Thunderkick software developers were inspired by this great feast of remembering the dead to create Esqueleto Explosivo video slot. As you would expect the game features funny looking skeletons bearing skull painting makeups. The skulls marked with different colours represent the band members who are also the symbols of the game. You will come across the Dropping symbols, the Mucho multiplier and a strange wild symbol that will blow other adjacent symbols. Thunderkick has employed the latest cutting edge technology in crafting this video slot. As such. You can play it across primary gaming devices including mobiles and tablets. 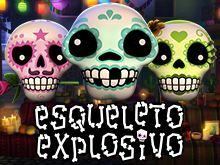 Esqueleto Explosivo slot is based on the Mexican feast called Day of the Dead, where friends and families unite to remember their beloved ones who passed away. The Mexican strongly believe that by recognising their departed relatives on this particular day, they may come back to visit them in different forms. The skulls are displayed to symbolise death and rebirth. The graphics used in the video slot are nothing but superb! And the interface is user-friendly and straightforward. You will enjoy the unique 3D animations and high end graphics that create an immersive gaming experience for all players. The state of the art graphics and animations are perfectly complemented by excellent Mariachi soundtrack that will accompany you in the background. Playing Esqueleto Explosivo video slot is fun and exciting across all gaming platforms. This slot comes with different symbols and unique features to increase your chances for huge payouts. Like other slot games, the objective is to try and land all the skeletons on the ground by forming the right combination. Esqueleto Explosivo slot uses a standard game format of five reels three rows and 17 fixed pay lines that payouts from the left to the right reel. You will find the different betting options placed at the bottom of the screen for easy accessibility. The bet size can be adjusted from $0.10 and $100 and only one coin per line is accepted. The theoretical return to player percentage of 97.6% is friendly to players with different budgets. If you have played Thunderkick slots before, you understand that the Total Cash button is placed in the lower left corner of the screen while Total Win button is just right above it; and the Cash Bet Value option adjacently. The Spin button in the bottom right corner, but you can opt to use the Spacebar key. To adjust your bet, click on the '1' icon by the chip and change the value of each spin. The Autoplay option allows you to play up to 5000 spins automatically without interference. There are several symbols and special features used in Esqueleto Explosivo video slot to increase your chance of winning. 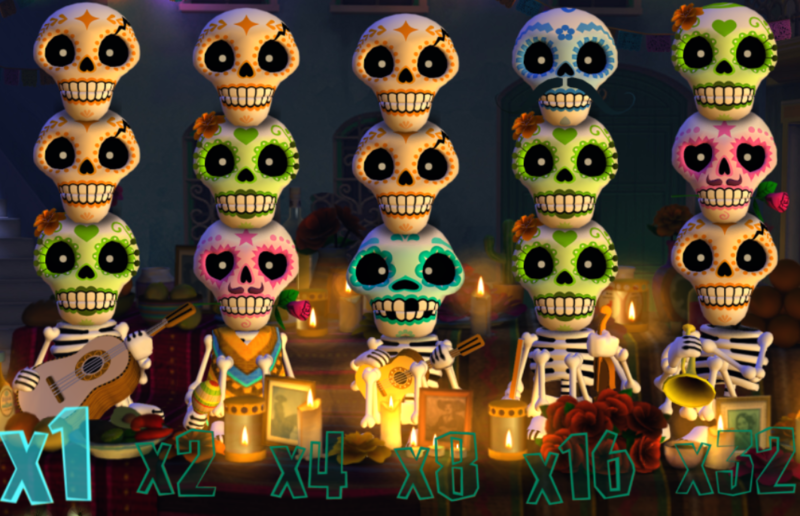 Skulls of different represent the five regular symbols, and they offer different payouts. The skulls not only differ in colour but also the number of teeth, the shape, moustaches and the shape of the socket. The two main symbols to look out are the Enrico Mortis and the Boners band playing a Mexican track below the reels. The golden skull represents this symbol with a funky hairdo and sunglasses. It can substitute for all other game symbols and will always blow you [ all eight nearest surrounding symbols for a new chance to win and boost the multiplier by one level. The golden symbol has a more significant role than just replacing other symbols. The symbols you win on gets replaced with new or existing symbols. This will continue as long as there is a late win. This one of the most appealing features of the slot as it can reward up to 32 times the bet amount. For each win on a drop or at least one explosive wild show up, the more multiple increases by one level. Esqueleto Explosivo video slot is compatible with major mobile operating systems like Android and iOS. Thunderkick has used the modern HTML5 technology which enables it to run on smartphones and tablets. You don't have to worry about downloading any software. The slot is fully optimised to be accessed directly via standard mobile browsers like Opera, Safari, Chrome and Firefox. There are dozens of online casinos offering players with an extensive collection of video slot games. However, it takes a reputable casino operator to partner with a large slots games developer like Thunderkick. bCasino is one of the few UK based online casino offering slots from this renew developer. We pride in listing games from more than ten remarkable software developers in the gambling world who power our site with top quality games and services. All our slots are independently tested for safe and fair gameplay before they are updated. We also accept some safe and secure deposit and withdrawal options like Neteller, Skrill, Paysafecard, Mastercard and Visa to ensure that our players get their money fast and safely. , and we secure our customer's pieces of information with the latest 128-bit Secure Socket Layer (SSL) encryption technology. Our site is mobile, and you will enjoy an incredible welcome bonus of up to $1200 a free spins. Enjoy our unparalleled customer support from experienced and friendly agents via email, live chat and telephone 24 hours 7 days.